This week as Americans begin their celebrations of thanksgiving I once again started to think of how fortunate we are and wondered what Thanksgiving actually meant. In my mind, and not being American, it is a day of giving thanks and being truly grateful for all that we have. A quick search on the internet reveals that the US holiday dates back to 1621 and commemorates a harvest festival celebrated by the Pilgrim Fathers. It is held on the fourth Thursday in November where family and friends come together and is usually a four-day holiday period. The concept is similar to the harvest festivals that we celebrate here in the UK during September, giving thanks to the land and all that it has reaped. However, another special event that takes place in November is Remembrance Day. Every year on 11 November at 11am we observe a two minutes silence which marks when the first world war officially ended and is in memory of those who have fought in all conflicts. The tradition of the two minutes silence started on the anniversary of Armistice Day in 1919. During early November, a team of volunteers for the Royal British Legion, come together to sell poppies up and down the country for what is known as The Poppy Appeal. We make a small donation in the collection box and we wear our poppies with pride as we remember those who have fought and lost their lives in past conflicts. The poppy has long been associated with Remembrance Day and has become a symbol of the sacrifices made in past wars. This was because the flower was the only plant to grown on the barren battlefields of Northern France and Flanders once the conflict was over. 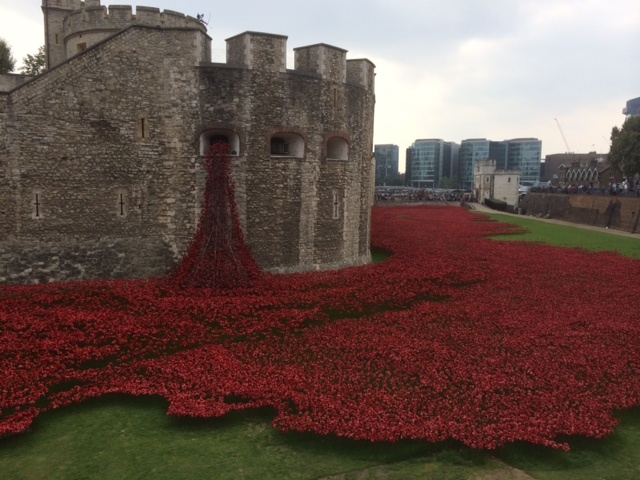 For me, November this year has been quite a special month, and I am sure it has been for many people here in the UK who made a visit to The Tower of London to see the exhibition of poppies called “Blood Swept Lands and Seas of Red”. This year at the Tower of London and to mark the centenary of the outbreak of the First World War, it was decided to install 888,246 ceramic poppies in the moat of the Tower of London. One poppy represents a life lost during the first world war. The planting of the poppies began in July and the last one was planted on 11 November. Not surprisingly, it has become London’s number one tourist attraction. There isn’t a person that I know who hasn’t been to see the poppies and been touched by this amazing sight and all it represents. One poppy for every life lost and to see each poppy carefully planted really brings home the loss and devastation of not only the first world war but all subsequent wars. We all know someone who has lost close ones, relatives, grandparents and great grandparents in conflict and I think this has been a fitting tribute. The poppies are now being dismantled and are being carefully packed ready to be sent out to all the people who bought them, raising millions of pounds for six service charities in the UK. So this November, as I reflect on such a spectacular and touching tribute, I want to give special thanks to those who have given their lives and continue to do so in all conflicts for the freedom we enjoy today. The sight of all the poppies and lives lost will stay with me for a very long time and I am truly grateful to all those who fought for our freedom. I would love to hear from you if you visited the Tower of London and your thoughts, or alternatively if you are living overseas how you feel about this amazing tribute. Wishing all my lovely readers a happy and love filled thanksgiving week. Following on closely behind the Ice Bucket challenge, there now seems to be nominations for posting five photos to FB that make us smile. I am sure like me, many of you have found it extremely difficult to choose just five. There are just too many photos that make me smile and make me happy. There are many photos that have been taken over the years that make me smile. However, the good thing about this challenge, apart from the fact that it doesn’t involve having a cold bucket of ice thrown over me is it has meant I have flicked through lots of photos over the years, not just the ones on FB but also good old fashioned printed photos. It is very rewarding to see the constant things in my life such as my friends, family and animals and I am sure that is the same for everyone else who has been nominated to select five photos. Yes, we have all changed, dare I say even grown older, moved, lost loved ones, but it just goes to show that whatever life throws at us it goes on and it is the constants in our lives that make us happy and thrive. I recently attended a reunion from a work place that involved a lot of travel and living overseas for a period of time over a five year period which meant we made lots of new friends and met a lot of new people. Many of us have kept in touch over the years but naturally with busy lives and people moving on it has not always been possible to keep in touch with everyone. The beauty of reunions is they reunite people that have lost touch with each other. At this particular reunion I met up with some people that I had not seen for 26 years and remarkably we all continued chatting like we were only together just yesterday. I’m sure many of us have attended these events, and people are usually asked to send in photos ahead of the reunion so they can be shown on the day or night. It is incredible that just by looking at a photo all the memories come flooding back, the laughter, the tears, joy or excitement, especially if a song is also being played that was popular at that same time. It is always great to join a reunion and reminisce but that is exactly what it is, reminiscing over how life was back then in the past. I like to look back but I sometimes think there is a danger to forget that we still have the rest of our lives to live and there is of course that wonderful thing we have called the present to create even more wonderful, happy and new memories. Also I can’t help wondering if we can sometimes over romanticise the past. I would love to hear your thoughts on how the past is viewed and what you think of reunions. 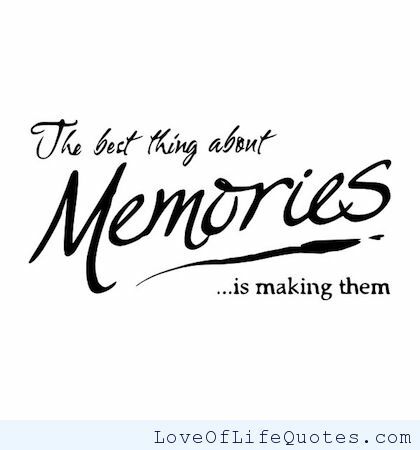 In the meantime, let’s keep making many happy memories. After all, I believe it’s what life is for and I hope you enjoy the following clip. Time to reminisce on this dark Monday evening. Wishing everyone a love filled happy week. Last week I touched on overcoming our fears and how they can sometimes hinder us from achieving our goals. So this week while deciding what to write I decided to write about following our dreams. 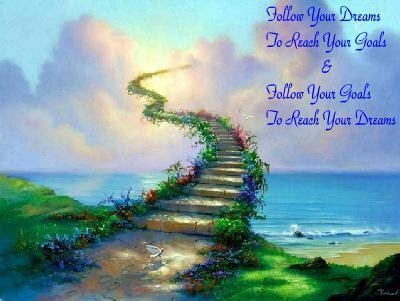 For each and everyone of us our goals and dreams will be different at various stages of our lives. Some of us dream about getting married, having a big white wedding, having children, becoming a professional footballer or an airline pilot or even flying to the moon. The list is endless. I tend to dream big and my close friends all know exactly what my dreams are, but the key for me is I appreciate what I have right here right now and I believe I’m already living my dreams to a certain extent. So how is that possible? I think it depends on how we choose to look at things and what our take on life is. I like to think we are in the process of achieving our dreams all of the time. For example, if it’s a job promotion you want, you are probably taking exams to better yourself and become qualified for when that job does come up. If your goal is to pay off your mortgage – then with every monthly payment you are one step closer than last month to paying it off. It is a process. My dreams are so huge I sometimes wonder how I will ever achieve them but I have lots of fun trying and I imagine myself living those dreams. By doing this I am a much happier person, I smile and enjoy life more because I believe that every day I am “in the process” of getting a step closer to achieving my dreams. In fact it is my dreams that get me out of bed in the morning. I am a strong believer in visualisation and when I look back on things that I have achieved in life, I would say quite a lot was through visualisation. This encourages me and gives me faith that anything is possible. So what is visualisation? It a technique of using our imaginations to focus on our goals and dreams with the intention of making them come true. Many successful people, particularly athletes, use visualisation either subconsciously or consciously as a way of life. I believe I used it when I was younger without even realizing it but having discovered visualisation techniques I now realize that I’ve been doing it all my life. For visualisation to work we can’t just sit at home and wait for things to come to us, we have to put ourselves out there. For example, if we want a new job, then our CV has to be updated and sent out to prospective employers, alternatively if we want to find a partner, it’s no good sitting at home waiting for Mr or Mrs Right to come along on their white charger, we have to put ourselves in situations where we have opportunities to meet someone. By visualising, putting ourselves out there and having a positive frame of mind people respond to us differently and we find ourselves in situations we might not have before and opportunities start appearing in everything we do. I would love to hear whether you have ever used visualisation to realize your dreams or how your dreams have come true. If anyone would like to find out more about visualisation then I can recommend an excellent book called Creative Visualisation by Shakti Gawain. Wishing my readers a week full of dreams and happiness. As we have just recently celebrated Halloween I wanted to write about fear this week. Not the kind of fear or phobia that we might have for a large hairy spider but the type of fear that can sometime stop us from doing things e.g. a fear of flying. I once remember excitedly telling my Mum about a horse riding and camping trip I’d planned to take in the Torres Del Paine region of Chile and instead of sharing my enthusiasm her first words were “but what if you break a leg”. To me, this was a strange comment to make and I pointed out that I could just as easily break a leg crossing the road. If we stopped to think about all the possibilities of what may or may not go wrong in life when we wanted to embark on something new then the chances are we probably wouldn’t do anything. So what is it that we are so afraid of and stops us from doing things? It seems that most of our fears stem from fear of failure and the unknown, both of which can be a big block for most of us. 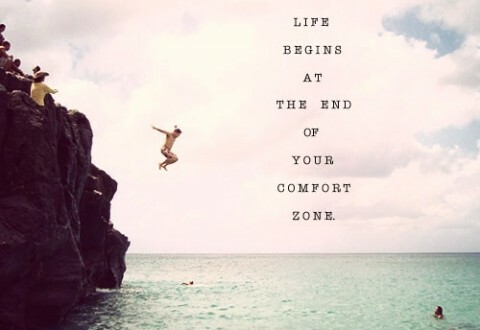 We like to keep within our comfort zones but by doing that it means we can sometimes become stuck never pushing the boundaries or trying new things. Surely it is better to have tried than not at all? I know many people who want to do things, myself included, but are too scared and they wonder “what if”. When we are children we have no fear, why should we? We have our parents and other people to take care of us as we boldly explore our worlds, falling off our bikes, out of trees or diving into a swimming pool for the first time. We are totally fearless. As we grow up and become more responsible for ourselves and others, we tend to lose our sense of adventure and begin to manifest our fears. These fears can be anything from fear of not being good enough, fear of failure, fear of letting go and being out of control, fear of being alone or abandoned or even a fear of flying. If we never face our fears they can sometimes paralyze us and can stop us living our lives to their full potential, thus foregoing our dreams and desires. Fears can also limit our actions and our minds. Louise Hay says that fear is a lack of trust in ourselves and because of this we don’t trust life. When we overcome our fears we are “taking a leap of faith”. The more we love and trust ourselves the more we will be supported. We will always have fears but it’s how we choose to overcome and deal with them that counts. It’s about letting go and going with the flow. So if you want to try a new hobby or change your job what’s stopping you? So my question to you is are you really living and embracing life or are there some fears that are holding you back in life? Wishing all my readers a fearless week full of love, happiness and moving a step closer to fulfilling your dreams .